Referred to by some as “green tea on steroids,” Matcha (in theory uses only for the Gyokuro shade grown variety) is a powdered green tea that delivers even more health benefits than brewed tea. We call all of our grades ‘Matcha” We carry both the Gyokuro grades and lesser more economical ones. When you drink Matcha you ingest the whole leaf, not just the brewed water. One glass of Matcha is equivalent to approximately 10 glasses of green tea in terms of its nutritional value and antioxidant content. Matcha is renowned for numerous health benefits. It is rich in nutrients, antioxidants, fiber and chlorophyll content. Not all antioxidants are created equal. Antioxidants are found in many fruits and vegetables however the class known as catechins (found in green tea) may be the most potent of all. Of the catechins, EGCg is the catechin with the broadest and most potent . 60% of the catechin content of Matcha is EGCG. Chlorophyll, the pigment which gives leaves their green colour, may help remove heavy metals and chemical toxins from the body. Our Gyokuro Matcha is rich in chlorophyll content because it is shade grown which increases the chlorophyll content in the leaves. Matcha also contains L-theanine, an amino acid known to relax the mind. For this reason Matcha is known as a mood enhancer. Buddhist monks drank Matcha to assist in meditation, as Matchs’s amino acids, combine with caffeine, offer a sustained calm alertness over time. Amino acids are also what gives Matcha it’s distinctive taste. Matcha tea contains caffeine. It may provide 4 to 6 hours of mild steady energy. 1 tsp. of Matcha contains approximately the same amount of caffeine as a cup of coffee but is released slowly. Matcha is both a stimulant and a relaxant, perfect for focusing on work, meditation, exercise or play. We also have a Creamy Matcha blend for those who want a Matcha with a little sweeter taste. We have blended Matcha with vanilla powder and some dehydrated honey crystals to give it a nice creamy taste. This blend is perfect for those just starting to drink Matcha. We carry a very popular Matcha organically grown in China. It is very good for smoothies, baking & drinking. 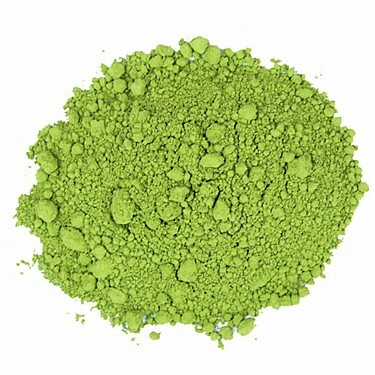 Our best grade of Japanese Premium Matcha powder is a Ceremonial Grade Matcha, yet priced reasonably for everyday drinking.